AP EdCET 2019, known as AP Education Common Entrance Test-2019 (AP EdCET 2019) is conducted on 19th April 2019 by Sri Venkateswara University, Tirupathi on behalf of Andhra Pradesh State Council of Higher Education for admission into B.Ed (Two years) Regular Course in the Colleges of Education in Andhra Pradesh State for the academic year 2019-2019. Sri Venkateswara University, Tirupathi going to release the result of AP EdCET 2019 on May 3rd, 2019. Candidates can download AP EdCET 2019 result along with the rank card in online mode in official website and Manabadi.co.in. With the declaration of the result, candidates who meet the minimum qualification marks criteria will be then shortlisted on the basis of merit list. EdCET-2019 is the Andhra Pradesh Education Common Entrance Test for admission into B.Ed (Two years) Regular Course in the Universities in Andhra Pradesh and their affiliated colleges. These tests are being conducted by Sri Venkateswara University, Tirupathi on behalf of Andhra Pradesh State Council of Higher Education. The candidates, who were applied for this entrance test, they were attended the entrance exam 19-04-2019 and they are waiting for their results for join into law courses. The results of AP EdCET will be uploaded at web portal by the Department SVU. AP EdCET exams 2019 Results to be declared on 3rd May at http://sche.ap.gov.in/EDCET. Candidates who have appeared for the exam on April 19, 2019 can check the results from the official website and Manabadi.co.in website. The EdCET 2019 exam was conducted to select students for admission in 2 year B.Ed course in various recognized institutions in the state. Sri Venkateswara University, Tirupathi, Andhra Pradesh conducted the paper on behalf of the APSCHE. RANKING: Candidates will be ranked in each methodology in the order of merit on the basis of marks obtained in APEd.CET -2019 examination. Where there is a tie in total marks, Part-C marks will be taken into account to decide relative ranking. In case of further tie, the marks obtained in Part-A will be taken into account to decide relative ranking. In case of candidates getting equal marks in each of the parts of the test paper, they shall be bracketed for the purpose of award of rank. At the time of admission into the course, age shall be taken into consideration for relative ranking among the bracketed candidates and the older candidates shall be given priority. The rank obtained in AP Ed.CET-2019 is valid for entry into B.Ed. course for the academic year 2019-2019 only. (v) In respect of State-wide Institutions, i.e., Sri Padmavathi Mahila Viswa Vidyalayam, Tirupati, Dravidian University, Kuppam admission to 85% of seats, in each methodology shall be reserved for the candidates belonging to the three local areas mentioned above and the balance of 15% of seats shall be left for the open competition. (D) If a local candidate in respect of local area is not available to fill any seat reserved or allocated in favour of a local candidate in respect of that local area, such seat shall be filled in as if it has been un-reserved. 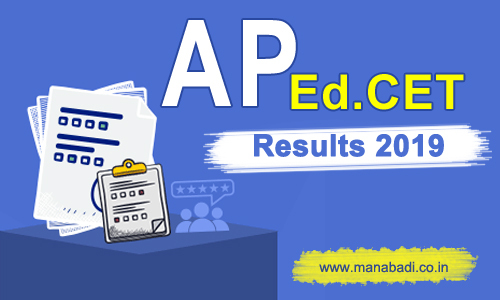 Browse for "AP EDCET Results 2019" Link. AP EdCET Counseling 2019 will be conducted after the declaration of AP EdCET Result 2019. Candidates having AP EdCET 2019 Ranks will be required to be present for Counseling with all the required certificates. The schedule of AP EdCET Counseling 2019 will also be updated soon. The Candidates who have not paid the processing fee or not attended for Certificate verification during the first phase should get their certificates verified on given schedule from any one of the three Help Line Center by paying the processing fee through payment gateway in https://apedcet.nic.in and exercise options till the last date as per the Ranks. Verification of Certificates of the Candidates for PH/CAP/SPORTS/NCC categories will be done at Acharya Nagarjuna University, Guntur and Sri Venkateswara University, Tirupati. CAP - Certificate issued by Zilla Sainik Welfare Officer (In case of Ex-Service men) Identity card and Discharge book for verification. Candidates whose parents are domicile of Andhra Pradesh are only eligible to be considered under "CAP" Category. NCC & Sports- To produce Original Certificates issued by competent authorities.The decision of the verifying authority is final in respect of above special reservation categories with regards to priorities fixed. Open the website http://apedcet.apsche.ac.in. Homepage displayed as follows. Click on the Web Options link for Exercising options. Instructions to candidate window will be displayed as follows. Read the instructions carefully, then click I Understood button. Enter the details as shown in the option form and click on Submit button. The Saved options can be viewed and/or print through the Print options link from home page also. The options exercised will be closed at 00.00 Hrs midnight on the last date specified for web options in the notification. Allotment made in the web counseling is final and cannot be altered under any circumstances. The convener is not responsible for any technical or human errors from client side (Student side) while exercising options.